"Captain? Captain Kirk! Well, you look like the devil himself... but as long as you're alive. What's it all about?" Espionage is the story in this episode. The Romulans have started using advanced Klingon designs for the warships and Starfleet intelligence has discovered the presence of a yet unrevealed technology that endangers the security of the Federation. Captain Kirk is acting very erratically as the episode opens and inexplicably orders the Enterprise across the Neutral Zone between the two spheres of influence and is immediately surrounded by Romulan vessels. Kirk and Spock beam over to the Romulan flag ship and the skills of the captain and his first officer are severely tested as they attempt to escape from the foolhardy situation that Kirk's order has led them into. It would be unfair to anyone who has never seen this episode to spoil the twists and turns of the well-realized plot. Suffice it to say that there is an intriguing amount of role reversal and disguise involved. William Shatner overacts the seeming madness of Kirk a bit. When the Romulan commander tries to get Spock to change sides and deliver the ship to the Romulans, Leonard Nimoy adds new depth to the Spock character with his slo-o-o-owly delivered lines of seduction. This episode has been notorious for its close commentary on current affairs of the day as it seems to slightly resemble an incident from the late 1960s involving the US intelligence-gathering vessel Pueblo. In that case, an American ship was seized off the coasts of Korea by the Communist North and the crew was held in captivity. In that case, as well as the fictional story, the justification for intrusive surveillance was security against a dedicated foe. Joanne Linville gives a memorable performance as the Romulan Commander who finds Mr. Spock so intriguing. This is another example of the progressive nature of the show in its time as Americans were not used to women in command positions (except in the case where it might be women from Mars determined to enslave the male population of Earth). This is a well-written episode that is acted with gusto and interest. With its taut intrigue and over-the-top ending, this is definitely a bona fide five-out-of-five Enterprise episode. 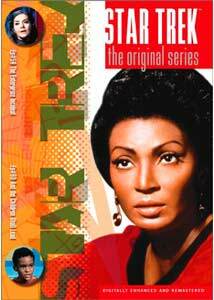 There are very few episodes of Star Trek that I will pass on if I catch them on the Sci-Fi channel in the afternoons. This is one of them. The story is a rehash of several other shows and worst yet, the gimmick involved is children. A mysterious force, seemingly long-dormant, has resurrected itself and now threatens the ship— sort of a Village of the Damned in space. This one is goofy from start to finish, from the way the children play to how they attempt to invoke the power possessing them and influence the behavior of the Enterprise crew. Oddly, there is a great amount of death in this episode. The show starts with what appears to be a mass suicide by ten scientists on the planet Triacus and the only survivors are their five children. Later in the episode, Kirk decides to relieve the two-man security detail on the planet and, not knowing the crew has been tricked into leaving the planet, beams them to their death in open space. I had to stop and think about what it would be like to suddenly re-materialize in space! Well-known attorney Melvin Belli appears as the Gorgon, the personification of the evil force, and he has a distinctive non-actor presence that has always struck me as odd. The children feature several familiar kid faces from the 1960s and their performances add to the non-Star Trek feel of the story. It seems more like something from the Twilight Zone or Outer Limits. On my shortlist of the worst of Star Trek, this episode gets one Enterprise and should be thankful for it. Image Transfer Review: The image transfers continue the high standards of the collection. The ship interiors look beautiful and in particular the contrast in The Enterprise Incident between the well-lighted whites and reds of the Enterprise and the murky grays and greens of the Romulan vessel are nicely toned. And the Children Shall Lead, in this case, exceeds its companion with a lovely quality transfer with rich colors and very crisp detail. Several special effect shots suffer slightly but the show just looks great. Audio Transfer Review: Another nice job on the 5.1 Dolby Digital audio. Very subtle expansion of the sound across the stereo spectrum provides depth without the artificial quality that over-processed sound can have. Neither of these episodes provide much opportunity for much re-processing of the sound. A split decision on this disc. The first episode is a winner and a candidate for any list of the best episodes of the series. The second is limp, absurd and goofy. Tough in this case, because every fan should have The Enterprise Incident for its political awareness, even if it comes with its doleful companion.